Groups are subject to a 2 week cancellation policy & group reduction policy. Failure to do so will result in the charge of the 1st night. All groups of 6 or more are subject to a 20per person, €300 deposit against damage and noises to and in the room on all group bookings of 5 people or more . A member of staff along with the Group Leader will complete a room assessment upon check in & check out. The deposit is refundable as long as the room is left in the same condition it was found in. Children under the age of 16 must be in private accommodation. This means that the whole room must be booked out for sole occupancy. All persons under 18 years of age must be accompanied by n adult. When booking for 5 persons or more, different policies and additional supplements will apply. People from all over the world share stories, chill out and have fun in our big common area. It's the Ideal place for anyone travelling on a budget. The hostel comes alive at night with people chatting before they head out to enjoy Dublin's exceptional night life. Our staff will happily give you a map, tell you the best spots and point you on your way to Dublin's best pubs, clubs, shops, restaurants and tourist attractions. Have a great night's sleep and do it all again tomorrow! 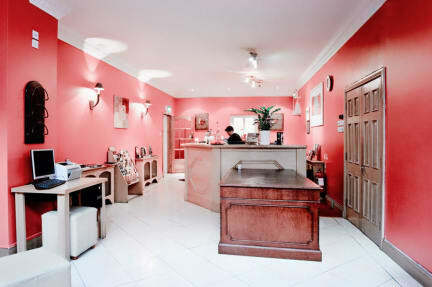 Reception is open 24/7 so you can come back or check in 2pm onwards check out time up to 11am each day. To cancel a reservation, please inform reception before 3pm, 48 hours prior to arrival. That is before 15.00 two days before intended check in. All Guests are required to present Passport or Id on check in and copy will be taken non EU Citizens Passports only. My Place Dublin is a 37-bedroom elegant Georgian Style Dublin Hotel. Our fantastic complex is located on Gardiner St, just off O’ Connell Street. We are the perfect base for any visitor to the Irish capital, with a vast local knowledge of Dublin city and it’s surrounds. We provide central accommodation with several years experience in handling individuals and groups of all sizes. From 1 to 150, we cater for all. We pride ourselves on our customer service and are known for great communication between group, agent and our reservations department.There is always someone available to talk to about any needs that your group may have. Check in time is 14:00, however we are open for check in 24/7. If your room is available we can accommodate you. If not, you my relax in one of our lounges or leave your luggage with us and you can explore everthing the city has to offer. The entrance to the car park is located on Cathal Brugha Street, Dublin 1.Guests are required to present Valid Photo ID Passport, Driving license, National Identity Card or Public Service card no other form of ID will be accepted and credit card upon check-in. Please note that all Special Requests are subject to availability and additional charges may apply.